Do you like peach pie? I do! Let me tell you a little story about the last time I made peach pie. I was at the farmers market and there was a man there that was selling peaches. He had pints and quarts of good peaches he was selling but he also had a few huge baskets of peaches that were overly ripe. 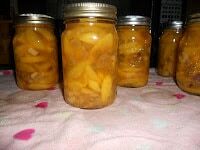 Being the savvy shopper I am, I bought 2 baskets of the overly ripe peaches and planned on canning peach pie filling. 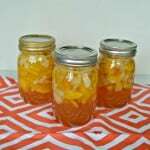 I made the peach pie filling and put it into jars. 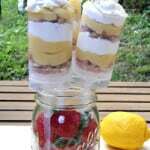 One day when my brother and his wife were coming over I used two of the jars and made a quick dessert. We all enjoyed the peach pie but there was something odd about it. While we were eating it the pie tasted fine. The after taste was unusual though. After several minutes my brother says, “This is going to sound weird but the after taste kind of tastes like A1 sauce.” As soon as he said it I agreed. How weird is that? I ended up looking up the ingredients for A1 and it includes apricots and golden raisins and 2 other ingredients that were in the pie. Isn’t that crazy? Needless to say I haven’t used that recipe since. 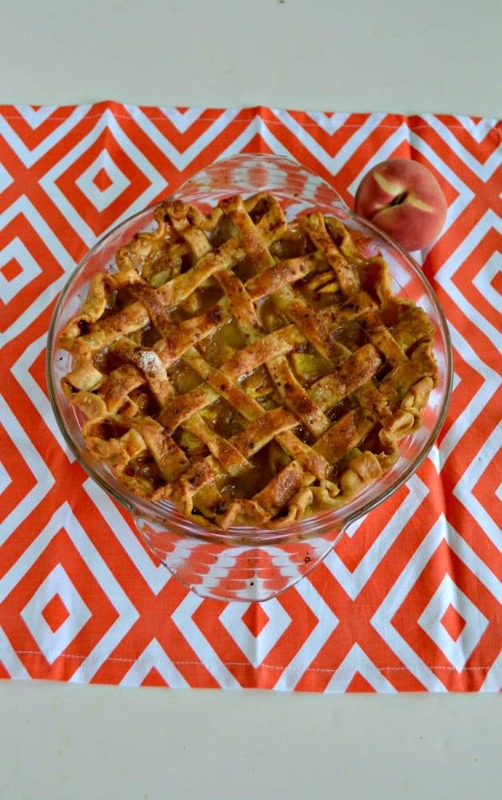 So, when my cousin asked me to make her a peach pie I immediately asked a few of my foodie friends for a recipe. I received a few but the one that sounded the best was a bourbon and brown sugar peach pie. It was from one of my favorite bloggers so I knew it was going to be good. Now another problem I have with making pies is that if I do a lattice design on top, it often ends up undercooked. I was worried about that with this pie but I was assured that wouldn’t happen. So I mixed up the filling of peaches, brown sugar, flour, spices, and bourbon and poured it all into an unbaked pie crust. I put the lattice on top, crossed my fingers, and baked it. When I pulled the pie out of the oven the top was golden brown, the filling was bubbling, and it smelled amazing. I kept going back in the kitchen to look at it but unfortunately there would be no peach pie for me until the next day at the birthday party. When we served the peach pie at the party every single person had a piece. I received numerous compliments and I have to say, it was pretty delicious. 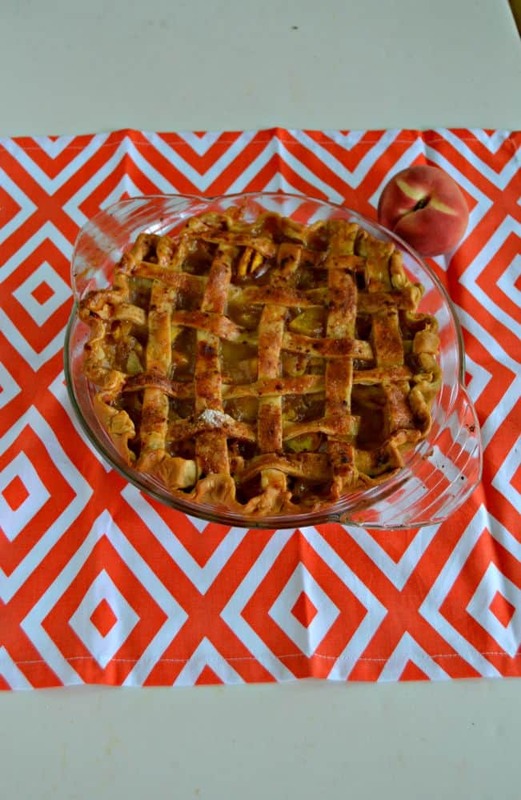 The crust was flaky and buttery, the middle was the perfect combination of peaches and spices. After everyone had a piece there was only one piece left. My husband and uncle were going to split it when my 13 year old cousin came running in, declared it the best pie he’s ever tasted, and asked for the last slice. They graciously allowed him the last piece of the pie. 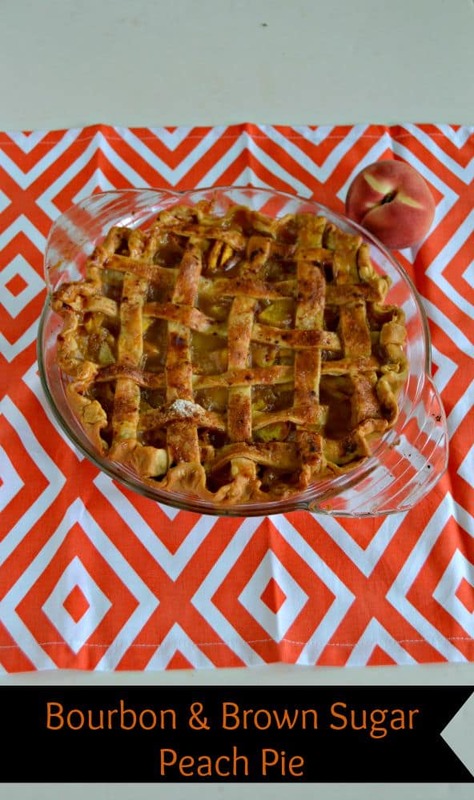 A delicious peach pie baked with brown sugar, bourbon, and spices for a tasty dessert. Place one pie crust in a 9 inch pie plate. Press the dough into the pan, being careful not to rip the dough. Set aside. 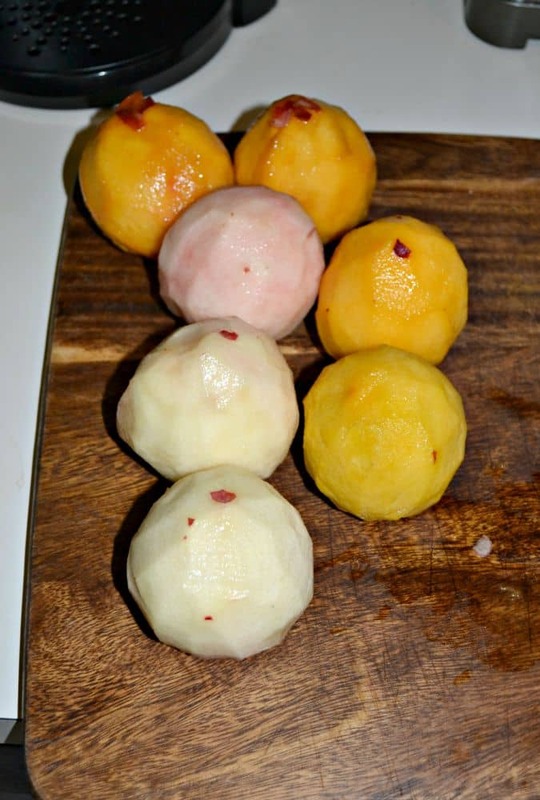 Peel the peaches and then cut them into ½ inch thick slices. In a large bowl combine the peach slices, flour, brown sugar, sugar, cinnamon, and salt. Pour in the bourbon and toss to coat the peaches. Immediately pour the pie filling into the prepared pie pan. Scatter the butter pieces on top. Brush the top of the pie with the egg and sprinkle with the cinnamon and sugar mixture. 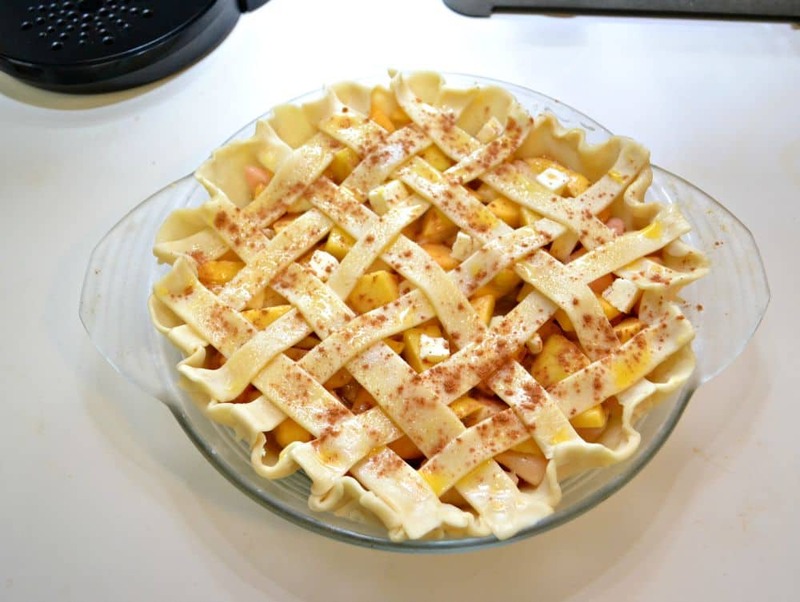 Place the pie in the freezer for 15 minutes while preheating the oven to 425 degrees. Bake the pie at 425 degrees for 15 minutes then reduce the oven temperature to 375 degrees. Continue baking for 45 minutes. 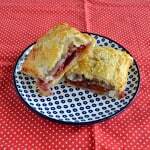 If the crust is getting too dark, cover loosely with aluminum foil. Bake an additional 10 minutes or until the filling is thick and bubbly. Cool on a wire rack for at least 2 hours before serving. What a delightful pie! Pinned for inspiration.